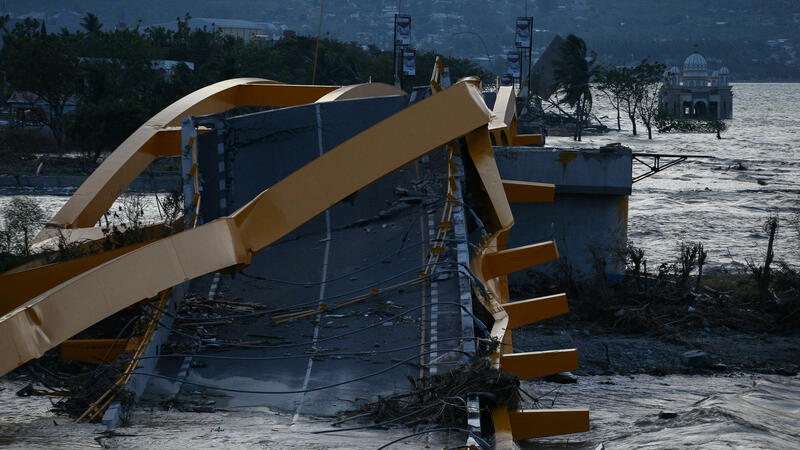 A bridge was wrecked at the city of Palu, after an earthquake and tsunami hit the area in Central Sulawesi, Indonesia. 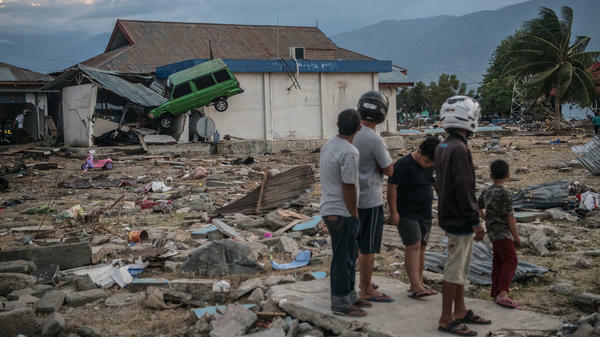 A car sits wedged into a building Monday, days after a tsunami struck the city of Palu, Indonesia, triggered by an earthquake. At least 1,200 people have been confirmed dead in the disaster. The tsunami was triggered by a 7.5 magnitude earthquake that struck along the coastal district of Donggala on Friday. Most of the dead were found in nearby Palu, a city of nearly 300,000 where an onlooker took a video of the seawater raging ashore just after 5 p.m., local time. Relief and rescue efforts have been hampered by communication and transportation problems in the stricken region. The damage caused landslides and forced Palu's international airport to close for at least one full day. Desperate for food and water, some local residents have taken matters into their own hands. The Jakarta Post says "many survivors blocked trucks carrying aid to plunder the contents" in Palu and Donggala. Photos from the region also show people clambering atop a fuel truck, filling up makeshift containers and passing them down to a waiting crowd. Other residents gathered at Palu's port, hoping to get at any supplies arriving by ship. A number of stores were looted, the Post adds. Videos posted to social media also captured the scene as the quake struck, with people scrambling away from large cracks in the ground as buildings either collapsed or simply slid away — their foundations overcome by the earth's liquefaction. President Joko Widodo visited Palu on Sunday, inspecting the large-scale damage and consoling survivors. He also acknowledged problems with getting aid to the region and urged people to be patient. Thousands of people began camping at the airport over the weekend, hoping to leave. But the airport has been operating at partial capacity since it reopened. And as they wait for a chance to fly out, people are also enduring heat of more the 90 degrees, with little to sustain them. Overwhelmed by the sheer number of bodies to deal with, local and military officials arranged for a mass burial site for the victims, according to Indonesian disaster agency spokesman Sutopo Purwo Nugroho, who says officials feared a prolonged delay could create a new health crisis. In addition to travel and communication problems, relief agencies say their response to the latest crisis is somewhat limited by the fact that many staff members remain deployed to Lombok — an island hundreds of miles south of Sulawesi, where a 6.9 magnitude earthquake struck one month ago. The relief group Oxfam boosted the scale of its response on Monday, hoping to help 500,000 people in Palu and Donggala. "This is likely to focus on the immediate needs such as ready-to-eat meals, water purification kits and emergency shelters," said Ancilla Bere, Oxfam's humanitarian manager in Indonesia of the effort. Bere added in a statement emailed to NPR that while access "remains a big concern with a key road cut off by a landslide and other infrastructure badly damaged," she's glad to hear the Indonesian armed forces are using military aircraft and helicopters to reach survivors. Another organization, World Vision, says it has dozens of staff members working in the affected area. The relief effort includes an infant and child feeding center in Palu, the group said. "Food and clean water are in extremely low supply, and many people continue to loot the markets and other places in search of food," said Radika Pinto, area manager for World Vision. "Access and security are making it challenging to start distributing relief supplies." On Monday, Indonesia's energy agency said it hopes to restore the electricity network within three days. In the meantime, portable generators and other supplies are being sent to the area aboard two C-130 Hercules cargo jets, according to Nugroho. The earthquake hit at 5:02 p.m., quickly triggering a tsunami alert. But about 30 minutes later, Indonesia's Meteorology, Climatology and Geophysics Agency canceled the warning, saying the quake was "not capable of generating a tsunami affecting the Indian Ocean region." Soon afterward, reports of a large tsunami began to emerge, including video showing a large wave ripping through homes and streets near the Palu Grand Mall. The earthquake was caused by "strike-slip faulting at shallow depths," the U.S. Geological Survey says. And while it's common to focus on temblors' epicenters, the agency says, "earthquakes of this size are more appropriately described as slip over a larger fault area." It estimates that this quake's size was around 80x30 km — or roughly 50 by 20 miles. The USGS adds, "Shallow earthquakes of this size can often have a deadly impact on nearby communities."